I'm so excited about today's post. It's not often that I have the chance to write about anything other than interior design. I do have other passions; it's just that most of them lead back to my love of interiors. For example, when I was asked to participate in this campaign with J.Jill my reaction was, "Yes! I seriously need a new summer/spring time look". The change in seasons has me ready for light layers, fresh colors, and cool, comfortable fabrics. When I saw the latest J.Jill catalog, the excitement over the opportunity to shop their latest looks and blog about fashion intensified. Then, I laughed as I remembered most things I enjoy relate to interior design in some way. Putting together outfits is no exception. I've always loved to shop for clothes, but once I began to apply interior design concepts to fashion, it became even more fun. Below are two mood boards I created to show the direct correlation between a room I designed and my recent finds at J.Jill. First let's talk about the room; I would describe this space as classic and comfortable. 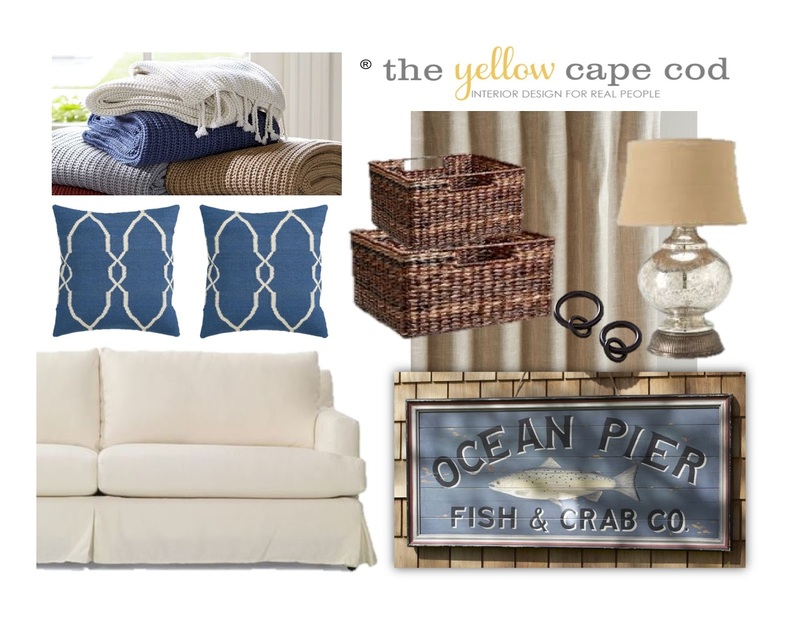 The fresh color palette, nautical accents and gauzy linen fabrics give it a breezy feel. Linen is one of the oldest fabrics in use today, so it's the definition of classic. It brings a sense of lightness and lends pure, organic comfort to a space. When this room is placed next to the fashion ensemble I put together at J.Jill, you can see how they have same look and feel. Classic, comfortable, and breezy are words that I would also use to describe the fashion mood board. There is a reason these boards look so similar. Before I break it all down, let's start at the beginning. I'll tell you how my new wardrobe came together. I visited my local J.Jill and a friendly associate introduced me to pieces from a few different collections including their Love Linen line. The Love Linen line includes blended knits, fresh details and watercolor effect prints that offer new ways to experience linen. After trying everything on and falling in love with it all, the time came to make my selections. I was able to narrow everything down into a classic, comfortable, breezy wardrobe by applying interior design concepts to each item. I treated each piece as if it were an element to a well-designed room. This knit poncho is the throw blanket. This soft, comforting, Textured Pointelle Poncho is my new favorite layering piece. Just as a knit throw blanket adds a layer of texture, warmth and softness to a space, this wrap adds the same qualities to my wardrobe. This scarf is the art. The gorgeous color and pattern provided by this Linen-Blend Paisley Scarf gives my new outfits a layer of interest, color and personality. Just like this nautical art gave the room a summertime feel, the watercolor-inspired paisley print of this lightweight scarf gives my new outfits the feeling of summer. 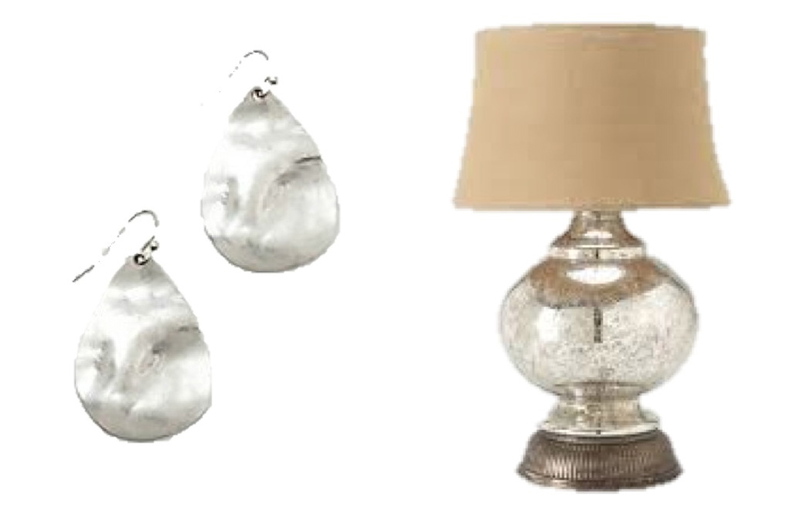 These earrings are the lamp. Adding something shiny dresses up and finishes off any well-designed space, these gorgeous Artistic Teardrop Earrings are the perfect way to complete my new outfits. This leather bag is the baskets. Both the J.Jill Leather Tote bag and the baskets provide storage for necessities. Just as the rich brown color of these baskets provide contrast to the light elements in the space giving it depth, this gorgeous bag does the same for the wardrobe. These floral print pants are the toss pillows. 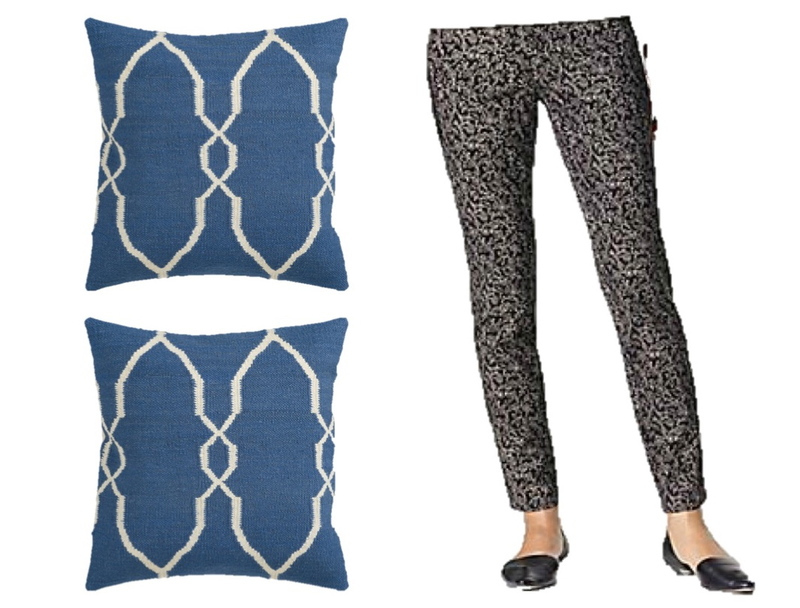 Adding patterned toss pillows is an easy way to give an overall neutral space interest and personality. These Perfect Side-Zip Print Ankle Pants did the same thing to my new outfits in the fitting room. Their fun abstract print is graphic and eye-catching. 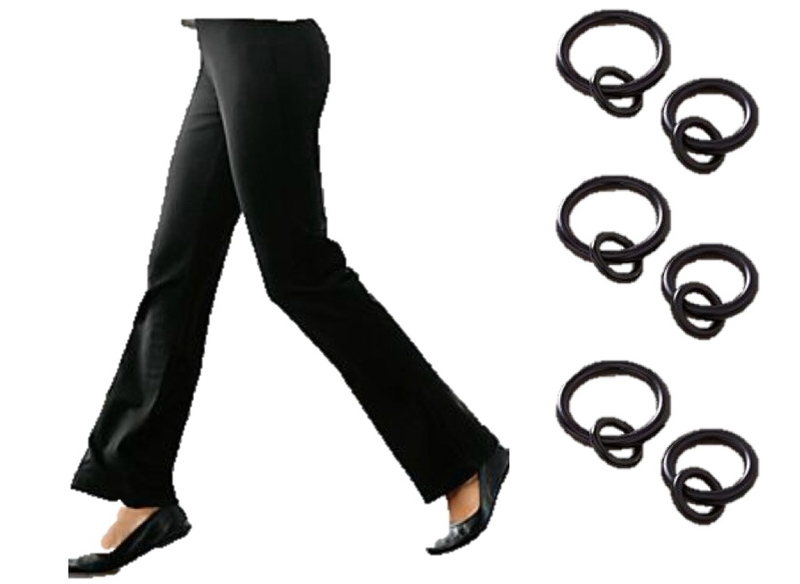 These solid black pants (and the solid black tank top) are the black drapery hardware. No matter what is changed out in this room, the iron hardware (drapery rods, ring clips and tie backs) will stay. They are a staple that ground the design. Since black looks good with almost anything, these pants and tank ground this wardrobe. These Pure Jill Boot-Cut Pants are amazingly soft and comfortable. They can be worn anywhere, whether dressy or casual. The black Spanx Trust Your Thinstincts Tank top makes layering easy, not to mention it has slimming qualities. The sweaters are the sofa. In my room design, comfort was one of the main goals. Down wrapped cushions give this sofa it's amazing softness. Once you sit on a sofa like this, you never want to get up. When it came to choosing my new wardrobe pieces, I found the same qualities in the Perfect Cardi sweater. Not only is it pretty, but once I put it on I didn't want to take it off. This linen button up shirt is the drapery. 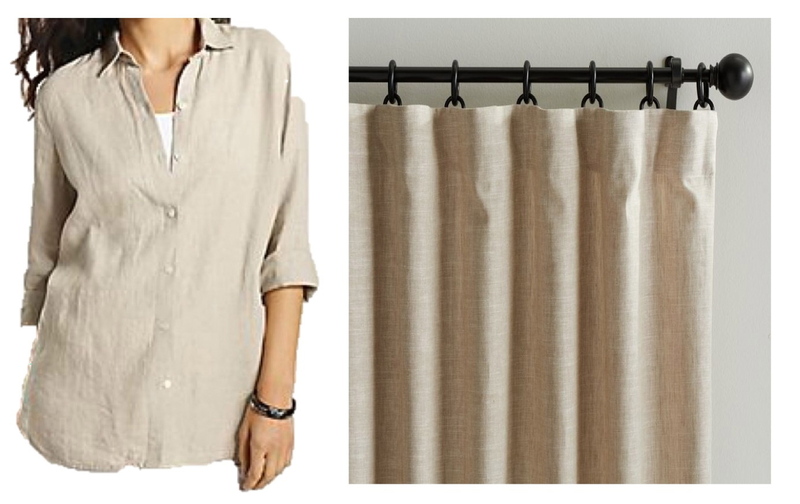 As I mentioned, I love to incorporate linen into my interior design projects, especially in drapery. Therefore, it's no surprise that this Linen Big Shirt immediately spoke to me. It has an incredibly comfortable, casual, relaxed fit with a gorgeous draping quality. No one knows linen like J.Jill. Modern finishing techniques have lessened the tendency of linen to wrinkle (yay!). This top feels cool to the touch, it's highly absorbent yet has natural wicking that makes it perfect for hot and humid days. Another bonus, J.Jill linen is machine washable! My shopping experience at J.Jill was wonderful. The store associates gave me one on one attention and made shopping J.Jill a lot of fun. Not to mention I'm in love with my new clothes. Thanks for going behind the scenes with me to see how your favorite room can become your favorite outfit. If you would like to get these looks for yourself, please use my special discount code "BLOGHER" when completing your purchase. This code is good for 30% off one regular priced item, valid through May 21, 2014. What is your favorite spring look? This sweepstakes runs from 4/3/2014-5/27/2014. Be sure to visit the J.Jill brand page on BlogHer.com where you can read other bloggers’ posts! I love your new clothes! They really embody the look of the room! In the spring, I love a pair of cropped pants with a sleeveless shell and a cardigan, to handle the temperature swings of spring. I love J Jill already and my favorites there are the Pure Jill t shirts. I love J Jill and their Linen Shop. A floral shirt with cropped linen pants is such a classic look. Lovely. I love the linen tops, and the silver jewelry. The sense of freshness and newness of season. Lovely. I love the linen tops, and the silver jewelry. The freshness of the new season. Beautiful. Well, is it really spring in Michigan yet?? I'm hoping it comes soon! My favorite (warm) spring outfit, is a pair of lightweight pants (linen, seersucker, etc), a great white tshirt, and a cardigan or jean jacket over top in case it gets chilly. Then add a great bright colored bag or statement necklace to add the color we've been craving all winter! Another great spring outfit is a fun, easy dress (finally without tights!!) and a cute pair of flats. I love the pants and the leather bag you picked up at JJill! Great choices! I love the colorful flats and moccasins in the latest catalog! I love the linen shirts that are so casual which says spring to me. I love the linen top! So comfy! My favorite Spring look is pastel dresses for Easter. i love the easy linen dress with pastel shoes!! I love everything at JJill -my favorite Spring look is boyfriend jeans with a knit top and light weight cardigan! Actually, it was my favorite winter look too! I love the leather bag, add the simple yet elegant earrings, and finish with the big linen shirt. Ready for any springtime adventure. I'm loving all the bright colors now that winter is over! Bring on the sun! I'm loving all the bright colors now that winter is over! Bring on the sun and cute clothes! I love J Jill. Their colors and fabrics are sumptuous. After such a long winter, I really look forward to capris, cute sandals, and breezy tops. I love how you explained how to accessorize. I always admire people who look so put together like they stepped out of a magazine, but I haven't been able to pull it off myself. I'd love to pair my denim capris with that cute linen button up blouse and scarf that you picked! I live in JJill's cropped linen pants all summer long, and can't wait until the weather is warm enough in the Spring to pull them out. The big linen shirts, too! We just spent Spring Break in Hawaii, so they got to come out of the closet early this year! Those cardigans caught my eye in the new catalog, so I might have to add one or two. Lightweight, colorful scarves add a dash of color and make me feel ready for the warmer weather. J.Jill has such beautiful things! I like to wear a skirt, tank and sandals. My favorite Spring look: jeans and a white tee, dressed up with a colorful infinity scarf and cute heels! My favorite spring look is linen jackets with slacks. We get so much rain.. and linen dries nicely! A nice polka dot dress are my look for spring. I am crazy for linen and wearing pastel colors in linen always says spring to me. 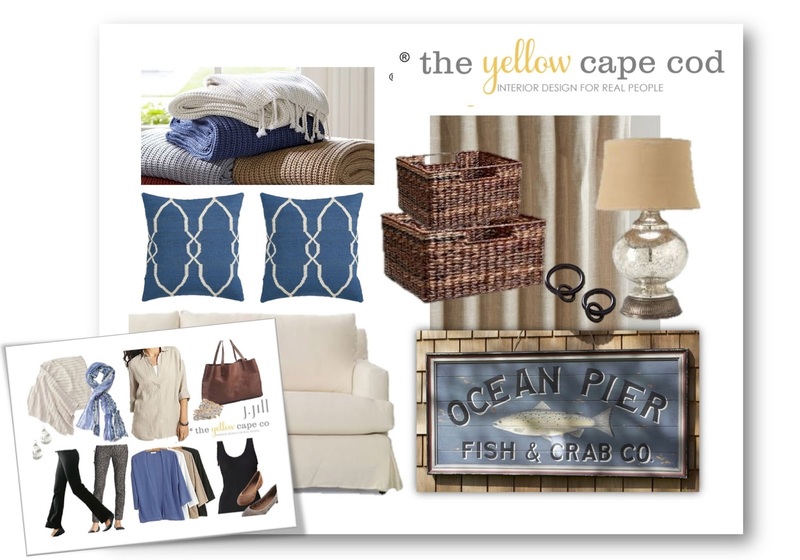 I have discovered that my home decor palate IS similar to my wardrobe! J.Jill's linen line is all me. Pairing my pastel linen outfits with a pair of flats and I am put together, looking bright and cheerful - hopeful - that definitely says spring to me. J.Jill's linen line is ALL Ollie. Love the look of jeans, flats, fitted shirt, and scarf and/or necklace and earrings! Visited J.Jill and they have some fantastic items! My favorite spring look is a long flowing skirt, tank top and loose knit cardigan preferably all in pastel colors. 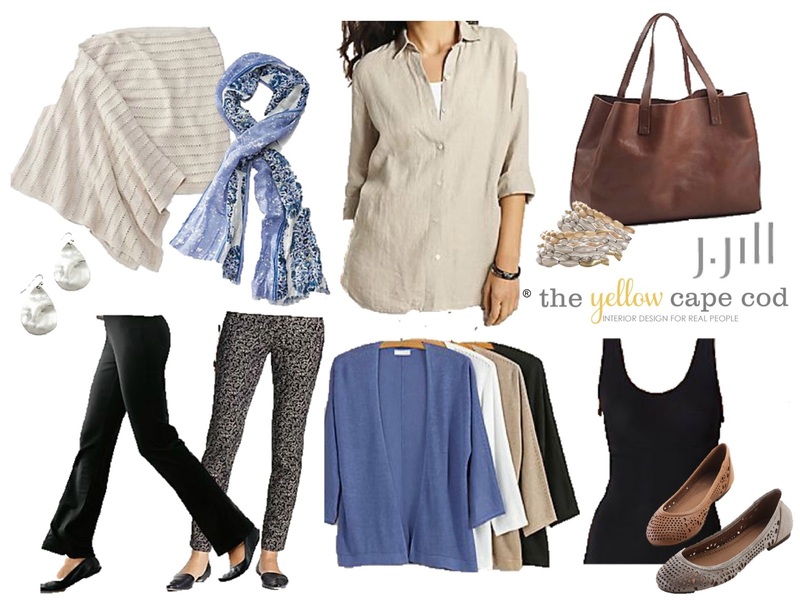 Favorite Spring look is carpi or ankle pants with a t-shirt and scarf. Love your new blue scarf! My favorite sping look is the tonal embroidered cutwork blouse! I like floral blouses, sandals, and capris. my fave spring look is jeans, tank top and sandals. I love the look of J.Jill clothes and linen is so cool & always works- practically year around. I love the J. Jill look and linen is so cool & practical. My favorite look is denims, trail shoes and performance wear. I like hiking in the spring. I love the t shirts! I love flowy skirts, bermuda shorts, blouses in pastel colors and coordinating sandals! I am all for comfort. This is a fascinating correlation between a room "look" and a wardrobe "look." Very clever! My favorite spring look is white capris with flowing, pastel-colored tops and strappy wedge sandals. Thank you! My favorite Spring look is a pair of breezy white pants or capris, a bright colored top, and sandals. I love a bright colored scarf in the spring! My favorite spring look is jeans and a colorful top with sandals. My favorite look for spring look is a nice pair of sandals paired with sunglasses and a pastel colored sun dress. My favorite go to spring piece is my J Lo flowy, orangy, t-shirt with black capris, but the tie-dye-stripe tank at J. Jill looks awesome! my favorite spring look a cute sundress and great pair of sandals! My favorite spring look is a maxi dress with wedge heels. I love maxi dresses. And I am NOT a dress girl! A floral maxi dress with a cropped jean jacket. It's perfect for work or going out to dinner or even going to church. My spring look will be maternity-dress focused! I like a pair of skinny jeans, a nice top, and my new jean jacket. My favorite spring look i a maxi dress! I love to wear a summery dress! Fresh, cool & colorful. I love to wear a long floral skirt and a pretty tank with sandals in the spring. my favorite look is an aqua cotton sun dress; it’s cool, comfy, and cute too! My favorite spring look is white capris and a chiffon tank. Casual capris with a tee or tank and cute sandals work for me. I love spring dresses that are bright, colorful and have a lot of movement. Cute outfits! I love skinny jeans with bright sandals. I like colorful capris with matching sandals. Love the capris with a tee and sandals! I love a cute pair of white jeans with brightly colored flats. My favorite spring look is a pair of neutral capris with a colorful shirt and sandals. Switch out the sandals and shirt and you can go from business casual to beachfront. I love wearing sleeveless shirts with sandals. I like tees capris and sandals! I love a maxi dress and sandals! My maxi dress with wedge heels. My fave spring look is a bright dress with dangly earrings! Pastels are my favorite look for spring. A white skirt or pants with a coral or aqua top is so pretty. My favorite spring look is a loosely fitting cotton skirt with stretch waistband that I can pair with different color tank tops and accessorize with jewelry and lightweight scarves. Maxi dress & cute flats for me. I love tank tops in the summer. I love simple dresses to beat the heat! My favorite spring look is white capri pants with a nice flower print top. I love linen pants and a light airy top. I really love peasant tops! Any floral top that just screams spring makes me smile. Pair that with cool linen pants and cute flats and I'm good to go.